I love paper flowers. So I thought I'd share some beautiful paper flower headpieces I came across while online. I could have called them hats, but somehow that word just doesn't do these stunning creations justice. 1. I really love the attention to detail and embellishments on this one. The colors are great too, don't you think? 2. I wonder how people come up with such fabulous designs? This ones's a beauty, but I don't think you could get on the subway with it. 3. Just like when you create floral designs with fresh flowers, the details really show up when you use a single color. 4. This one really says spring or should I say fall? The color combo is lovely and bright. 5. In my floral design, I tend to use bold colors, but truth be told, I really love these muted shades. The slight variations in color make this one very sophisticated I think. If I had to choose, I think I'd have to say #1 is my favorite. Your turn, which paper flower headpiece do you like best? Some people prefer fake flowers, because they require little or no care, don't die and never go out of season. Even though we don't sell fake flowers at Fly Me To The Moon, I admit, even I have some at my house. I live in an apartment in New York City, where it's hot all year long unless the air conditioner is on. Not the best conditions for keeping fresh flowers alive. But let's face it. There are good fake flowers and bad ones. I know. I know. I'm not supposed to call them fake. Some people call them artificial. Others refer to them as silk, though they aren't. You can call them faux flowers if that makes you happy. And the floral industry gets a kick out of calling them permanent botanicals. 1. Research fresh flowers. Before you can buy good-looking fake flowers you need to know what real ones look like. Visit a florist or look at images of real flowers online. Be sure to check out the leaves. Each flower has its own leaf shape. Makers of fake flowers blow it on this point all the time. By the way, different types of flowers don't all grow on one stem either. I'm just saying. 2. Choose flowers in realistic colors. Look for fake flowers in natural colors. There are no black lilies or roses in nature. No neon blue flowers either. If you're creating flower arrangements for a cutting edge special event, then go ahead and play with color. But, if you want those unrealistic colors to match your sofa they may look nice, but they won'r look natural. Which is fine, if that's the look you're going for. 3. Invest in good quality fake flowers. Realistic fake flowers aren't cheap. But they will look a thousand times better than cheaper ones for years to come. 4. Buy great looking inexpensive fake flowers. If you can't afford expensive ones, buy those that look like them. Visit a store that sells high-end fake flowers and study them. What makes them look real? Notice that they're never shiny. How do they display them? Pottery Barn is a good place to get ideas on how to incorporate fake flowers into your space. 5. Avoid weird details. Some fake roses have plastic water droplets on them. You can just peel these off. Others have little baby's breath type growths. Remove these too. Flower manufacturers think these things make the fake flowers look prettier. They're wrong. 6. Beware of super thick stems. Bunches of fake flowers are wired individually then enclosed in thick plastic to create one giant stem. You get lots of flowers for the price of one. Hide those stems in a vase you can't see through. 7. Divide and multiply. Just because your fake flowers may come in a bunch doesn't mean they have to stay that way. Separate bunches of them into different vases. Use wire cutters to cut the stems. If you use your good scissors, they won't be good anymore. An inexpensive pair of wire cutters should do the job. Learn how to make flower pens out of fake flowers here. 8. Go monochromatic. Find one fake flower you like. Buy lots of them in the same color. Place them in a clear glass vase with the stems arranged in an orderly design. I think this is one of the most stylish ways to display them. 9. Limit your color palette. Decide on a color scheme. To achieve an elegant look, use no more than 2 or 3 colors. Those colors should relate well to each other. If one flower is mostly pink, but has a hint of green and white use those colors to complement the first flower. Using 25,000 different colors will make your fake flower arrangement look all over the place. Focus on a few colors for the best result. 10. Dust them. If you don't keep dust off your fake flowers, they'll look an awful lot like fake flowers. Real flowers don't get dusty! Unless you're one of those who bring your fresh flowers home, put them in a vase and allow them to die in place without a single bit of care. 11. Add fake flowers to real flower arrangements. If there are real flowers that are too expensive or not in season for a special event, replace those with high quality fake ones. If you follow the tips above, few will even notice. 12. Just add water. Some people add water to their fake flower arrangements in clear vases to give the illusion that they are real. So those are my 12 tips for fooling people with fresh flowers. Actually, at Fly Me To The Moon Florists, we have the opposite problem. People have the illusion that our real flowers are fake. Either they think they're too pretty to be real or they've never seen them before. Not a bad problem to have I think. What tips do you have for working with permanent botanicals fake flowers to make them look real? let me know in the comments below. It's finally feeling like spring here in New York. Wondering what to do with all those spring flowers you're seeing for sale almost everywhere? Don't worry. I've got you covered. Below you'll find links to great posts about info on spring flowers you may not know, ways to arrange them, how to make your own bouquet, and how to display them in different ways. Oh yeah, and by the way, the picture of the flowers was not taken here in New York. It's from a cool houseware/cafe in Australia. They're actually re-doing their website now, but the link under the picture will take you to an article about them or you can visit the Armchair Collective Facebok page here. Spring is finally here! 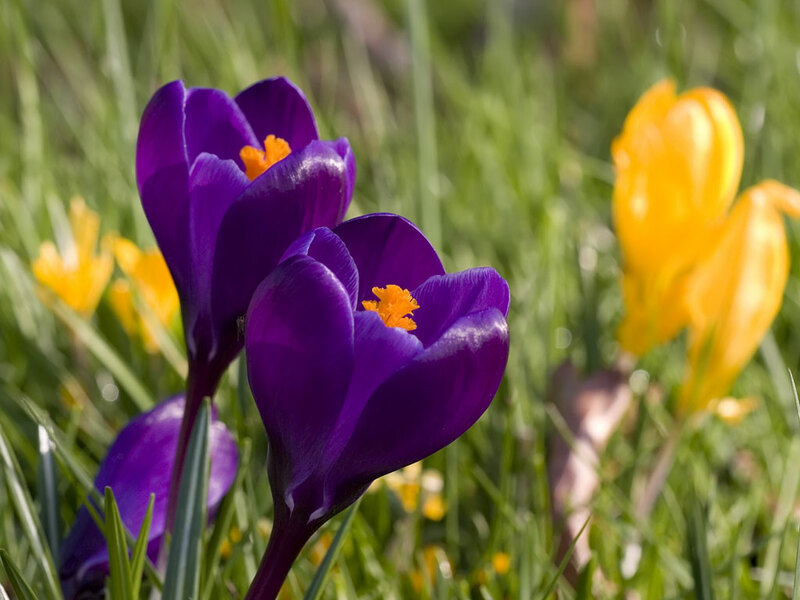 Your favorite flowers will soon be blooming in your neighborhood. No flowers growing near Fly Me To The Moon yet though. But some croci and tulips should emerge in a few more weeks. But while you're waiting, why not create your own spring flowers out of paper? 1. Crepe and Watercolor Flower Tutorial - Lucy Akins, over at her stunningly beautiful blog, Craftberry Bush, has created an amazing tutorial with great pictures on how to make a flower that looks like a peony to me. 2. How to Make A Paper Flower Daffodil - Brittany Watson Jepsen, over at her delightful blog, The House That Lars Built, has an incredible tutorial on how to make a paper daffodil, which is one of the first flowers of spring. 3. Make A Paper Easter Lily - Lia Griffith, a master paper flower maker, in my humble opinion, has a wonderful step-by-step tutoral on how to make paper Easter lilies to use for gift wrapping or display on her blog, Lia Griffith. 4. Bridal Bouquet - Paul Lowe Einling writes an online magazine and a blog called Sweet Paul, where you'll find a tutorial for making these coffee filter flowers. 5. DIY Crepe Paper Anemones - Learn how to make the unusual anemone flower out of crepe paper over at the Ruffled Blog. Which paper flower would you use for a party? Customers often ask how I come up with the floral designs at our boutique flower shop, Fly Me To The Moon. So I thought I'd share me process with you. My goal in working with flowers is to create lovely flower arrangements that will last as long as possible. How do I achieve this? By buying the freshest flowers. Purchasing from the best wholesalers in New York. Avid researching and conditioning of the flowers. And teaching our customers how to care for them. It's 5:26 am, Monday morning. I'm at the Chelsea Flower Market in NYC ready to select flowers for the shop. They came into New York at 2:00 am, so all of them should be on display by now. As much as I love buying flowers, I always glance longingly at those taking leave of 28th street before 5:30, flower-filled boxes in hand. It's like they've won some race I've arrived too late to even lose. In the flower business, the early bird really does catch the worm, but luckily, I can call ahead and ask the wholesalers to hold flowers for me. Often a rose is my inspiration flower. Some floral designers won't use them in their weekly accounts, but I know just the right varieties that perform well and look great. Next, I search for flowers that will enhance the look of my inspiration flower. It can either match or complement it. If a flower has three colors, I may choose flowers in some of those shades. I generally use a minimum of 3 different types of flowers in an arrangement. But, I often use more. Adding interesting foliage and fillers can sometimes take the place of a flower. I also consider what I have back at the shop in our walk-in cooler. Do I have something that would add great texture or presence to the flower arrangement? These flowers or plant materials were either purchased late last week or have a long vase life. A vase is often the first thing I choose, but since this corporate client prefers cube vases, I keep a bunch of them in different colors on hand and change from week to week. I sometimes use a cylinder vase to change it up once and a while. The arrangements for this particular client go on the concierge desks of luxury buildings down on the waterfront in Yonkers, New York. This is gonna sound a little crazy, but here goes. I listen to the flowers. I believe every flower in an arrangement has a perfect spot and that once placed there, it sings. Now, I've never actually heard a flower sing a note, but when I find that sweet spot all is right with the world everything else just falls into place. The arrangement of all the other flowers seems easy. Believe it or not, this is actually easier for me to do on a busy day like Valentine's Day. Another floral designer could create a beautiful yet entirely different arrangement using the exact same flowers. I guess that's where "having an eye for floral design" comes in. With no formal training in floral design, I thank God for this gift. I read a post the other day by Holly Becker over at Decor 8. She mentioned that a friend, Sania Pell, a London-based stylist once told her that "you need a little wrongness to make something right, especially when styling a room or vignette." I think the same principle holds true for floral design. A flower arrangement becomes more interesting when it has something unexpected. Something that doesn't belong there. You know, something wrong. So sure, I can make a flower arrangement sticking to a strict color palette and use of foliage or I can add something to it that takes it a step out of the ordinary. That's what I did when I added both the "gray" globe thistle and bright purple flowering artichoke to the above arrangement. It would have been fine without those elements, but see how much more interesting it is with them? So, that's my process for creating flower arrangements. You can see my floral design posts here. I hope you try at least one of them. If so, please let me know how it turns out in the comments below. When I think about Valentine's Day two things come to mind immediately. Flowers and hearts. So I thought I'd share some images I've seen around the web of hearts made of flowers. Please feel free to pin your favorites. Feeling inspired to make a floral wreath of your own for Valentine's Day? Stay tuned for a link to 25 tutorials at the end of this post. 1. Leave it to Ovando to create an upside down heart in their striking flower arrangement. The heart is made from steel grass. See Sandra de Ovando's tutorial here. 2. Roses of all sizes and shades of pink are used to create this beauty. 3. The extraordinary heart of red rose petals above is quite stunning in design. It looks like a glamelia, which is a bouquet made of lots of flower petals made to look like one big flower. See examples of glamelias here. 4. Love this heart, because it highlights the traditionally un-Valentine's Day color orange along with red. 5. The heads of red spray roses were placed in a heart shaped pan or cookie cutter to create this lovely design. This heart would be easy to make. Tres sweet! 6. Here's a multi-colored heart of roses from Martha Stewart. You can get more Valentine's Day flower ideas here. 7. A truly romantic heart of roses, spray roses and mixed foliage. Perfect for a wedding. 8. A heart of magnificent pink roses suspended in glass. It's both modern and tradtional. Quite a show-stopper! 10. A heart comprised of flowers in the shape of a heart. How clever? 11. Hang a pink rose wreath from on a branch. Would be lovely for an outdoor wedding I think. 12. 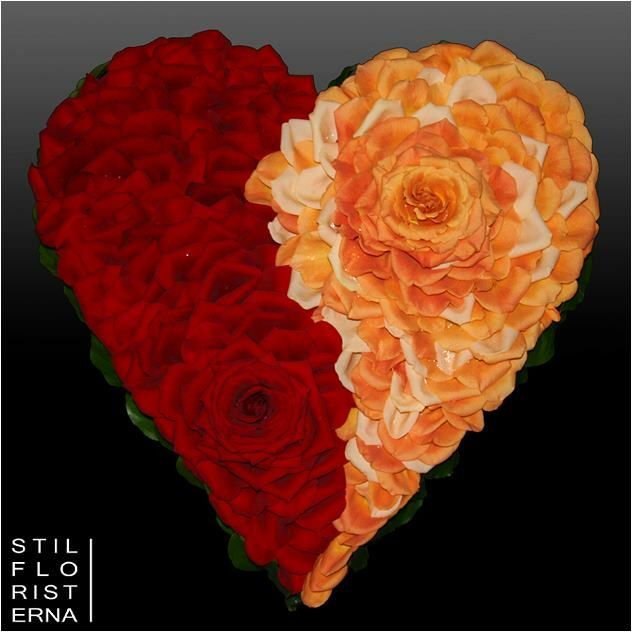 Love this floral heart created by Atelierflora, a floral company in Norway. You can see more of their creative bouquets here. 13. A pine cone wreath. I still have a beautiful garland hanging in front of our shop from the holidays. It's made of balsam, magnolia leaves, pine cones and red berries. I was actually thinking of leaving it up for Valentine's Day and paintng the pine cones pink to match my upcoming Valentine's Day window display. Perhaps I'm going too far. 14. A heart of branches embellished with small pink flowers. Delicate and feminine. So it's your turn. If you'd like to see even more floral wreaths or want to make one, check out the link below. It's nice to have flowers to decorate your tables for the holidays, but you don't have to spend a lot on a fancy floral arrangement. Explore the sites below to find some great and creative ideas for holiday decorating. Hope you found a holiday flower arrangement you'll try to make this year.